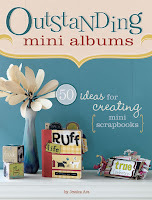 Personally, I have long been a fan of calendar-based prompts for scrapbooking inspiration. The stories that can be told by taking cues from the common and not-so-common (which can often be the best prompts...they often lead to some unexpected, yet important, stories) calendar events are literally endless. This is the fact that lead to the development of my own monthly Daily Inspirations prompts which are available for free download each month right here on this blog. It is also why I was very excited to see that Amanda Probst had a book coming out that drew its inspiration from the calendar as well. Month by Month Scrapbooking: A Year of Scrapbook Ideas is one very unique scrapbooking idea book and one can see this from first glance. The first thing I noticed about this book was its wonderful design which features spiral binding at the top of the book (like a calendar...get it?!). It also features what I can best describe as an 'easel-stand' back cover which allows you to prop the book up in an upright position. It's perfect for keeping right at hand on your scrap desk. There are 12 tabbed sections - one for each month of the year - and the first half takes you from January through June. Flip the book around and you'll flip through the rest of the year - July through December. One of my favorite parts of the book were the calendar-style layout examples and is one of the ideas that I most hope to experiment with myself. I have never created an actual calendar-style layout (highlighting the major events in a month) and think it would be a wonderfully fun way to document 'a year in the life'. Of course, each month generally mentions the obvious themes for that month (for example, Easter baskets in April and fireworks in July), but many ideas go a little deeper such as taking some time to focus on your fears in October or reminiscing about your various summer jobs in June. This book will certainly have you looking at the calendar in a whole new light and creating thoughtful and memorable layouts in no time flat!! 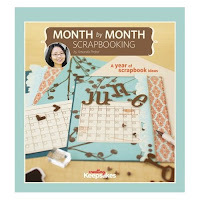 Visit the Month by Month Scrapbooking page at Amazon.com. You can also read more of my reviews for other recommendations.